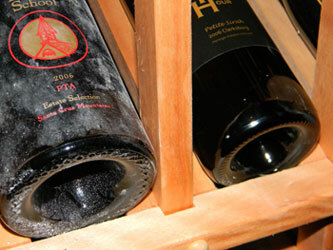 Ageability refers to how long the wine can be cellared and have it improve. At some point, a wine will go over the hill and it will decline in quality. While still drinkable, the peak of flavor was missed. So how to tell when a wine is ready? If you have access to the wine maker, ask. They will have the best idea. If not, you have entered the realm of guesswork. Opening a bottle, tasting it and realizing that it could sit for another couple of years is out because opening a wine almost always destroys its ability to be stored. Assuming you bought a wine to lay down and you bought more than one bottle, try opening one every 3 to 6 months and make notes about the flavor. When the wine is no longer undergoing substantial changes, that is the time to begin to enjoy it. If you do not have that luxury, the suggestions we have provided are generally safe assuming you bought a wine that was not made to be drunk directly off the shelf. Most California wines available in supermarkets, small liquor or other non-specialty wine stores are meant to be enjoyed immediately, particularly if they were mass-produced. To find wines that can be aged, click on the “Encyclopedia Varietal Report” button, (2nd button down on the left) and use Winery-Sage.com’s powerful database and filter tools to find the perfect Varietals.